Pupils from Balornock and Dunard Primary Schools attended Partick Thistle FC on Tuesday 29 November 2011 for a Show Racism the Red Card Event organised in partnership with Partick Thistle FC and Sporting Solutions. The event featured three educational workshops in the morning promoting messages of equality and respect, and the pupils also received a stadium tour. The afternoon involved a question and answer session on racism and sectarianism with a panel of guests - with the questions coming from the young people, prizes, autographs and a round up of the day. Guests on the day included first team Partick Thistle FC Assistant Manager Simon Donnelly and Captain Alan Archibald, ex-professionals and Show Racism the Red Card coaches Derek Ferguson and Michael Weir, along with John Kane , Head of Vocational Services - Glasgow City Council. The guests spoke about their experiences of racism and sectarianism and offered advice on how to deal with, and combat, racism and sectarianism whenever it occurs. 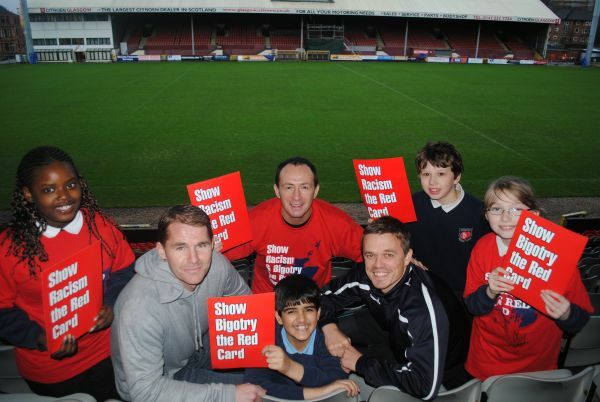 Amanda Peebles, Campaign Worker for Show Racism the Red Card added, “The input of the school pupils demonstrates a clear willingness to engage with anti-racist education in a positive and unique manner. The support and enthusiasm from Glasgow City Council and Partick Thistle FC demonstrates a clear commitment to stamping out racism and sectarianism in the region”. We would like to thank the two Primary Schools who attended this enjoyable and informative event.